This is still very much a restaurant (2015). No signs of it being a pub again, which leaves The Waterend Barn as the only Wetherspoons Pub now in St Albans. There are now rumours circulating that this will re-open as a Whetherspoons, possibly with a completely new refurb. 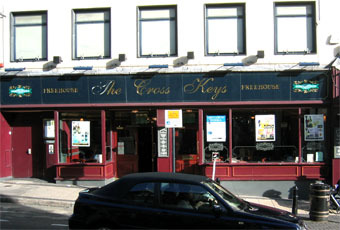 I passed by last night and can confirm that "The Cross Keys" is now being re-decorated and re-vamped to be re-opened soon as an upmarket Bar & Grill. So the only Wetherspoon Pub remaining in St Albans is "The Waterend Barn" which has extended it's range of real ale with barrels behind the bar. I was told by a member of staff that this is to be a permanent feature. A large proportion of pubs in St. Albans sell real ale. The staff almost always friendly. Had a better selection of real ale than the Water End Barn, although this has improved. Food standard Whetherspoons fare. The only gripe is that it is quite a dark place, due to dark furniture and lighting. If last post is correct, its not as big a loss in St Albans as if in another less ale friendly town. Typical spoons grub and beer but smaller than most spoons I've been in. Better pubs in St Albans unless you really are on a budget.